We are delighted to be partnering with this very special self-catering holiday accommodation in Burgundy, which is in a fine location near the vineyards of Maçon and Beaujolais in the southern part of the Burgundy region. The accommodation has been created in a wing of a stunning small chateau which is in a hilltop setting with fine views of the Brionnais countryside. You need peace and quiet for your holiday in France? You’ll find it here. 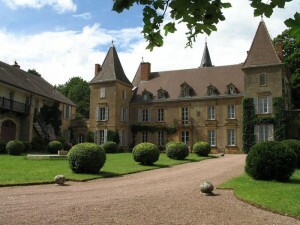 Explore the landscaped grounds of the chateau, relax by the swimming pool (new for summer 2013), visit quaint little villages, go wine tasting or explore the peaceful country lanes by bike. The gite is spacious and perfect for groups of friends as it has space for up to 7 people in 3 bedrooms plus loads of sitting and relaxing space on the ground floor. It’s full of warmth, charm and character and the best bit is that you don’t need to book a whole week as short stays can be accommodated! There is still plenty of availability in the summer months so if the idea of a short break in Burgundy France appeals to you, don’t delay. Get those flights booked today.